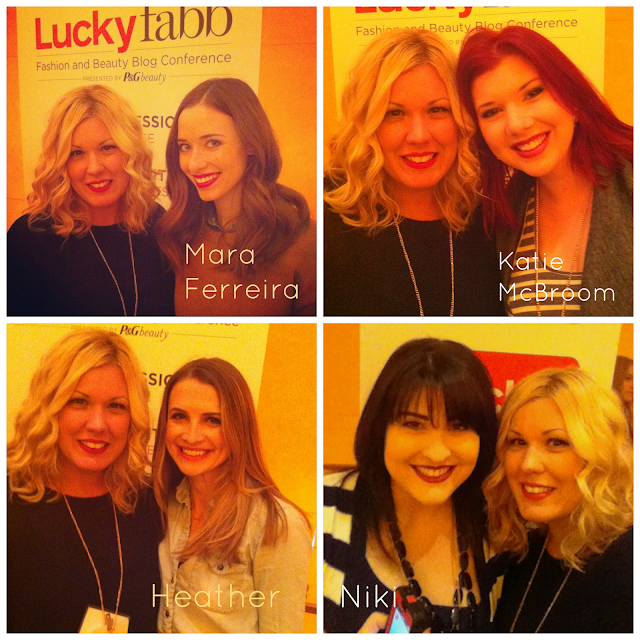 Thursday was a whirlwind.... Lucky magazine hosted their annual LuckyFabb Conference in NYC and this year, I was lucky enough to attend! While I couldn't attend both days, I did make it to Thursday's conference and let me tell you, I'm still dreaming about the whole experience! First, I met some amazing blogger friends who, until now, I'd only connected with via the cyber world. Second, I met the AmazeFestDotCom Eva Chen!!!! OMG!!! If you don't know who she is, you SHOULD! She's is the new editor in chief of Lucky Magazine and i feel that she's brought so much spark to that magazine! I'm still hyperventilating ever so slightly... but more on that later. Last, I listened to some incredible speakers and style influencers. This year's celebrity guests were Eva Mendes and Kate Bosworth! Whoa! OK, so lets start from the very beginning! I met up with the super sweet, gorgeous and ever so tall (I thought I was tall but she's supermodel tall) Niki from Hello Miss Niki! We instantly connected! She was first in line and was sweet enough to let me squeeze a spot in line with her. We were literally the first to walk in as the doors opened at 8:30... you know, fashionably early! We picked up our packets, complete with the day's agenda as well as the most gorgeous rose gold lanyard with our name tags. This lanyard can also be worn as a necklace now that the event is over! OMG love! Breakfast and beverages were being served at this time, but I was too nervous and excited to eat or drink anything! Niki and I took some pictures and chatted for a few minutes when I suddenly recognized a very familiar face! Mara Ferreira of the M Loves M blog, walked past me... being the big fan that I am, I decided to say hello! She couldn't have been more lovely! We talked for a while and I was excited to hear that she is Portuguese too! As pretty as she is on the blog, she's even prettier in person... how that's even possible, I just don't know! But I was delighted to have connected with her and even more pleased with how incredibly personable she was! A few minutes later the doors of the conference hall opened and we quickly made our way in to secure good seats! Just as the conference was about to start, the stunning and ever so sweet Heather from Beauty Unbiased made her way in and joined the fun. The conference began with one of my current idols, Evan Chen chatting about all things fashion and beauty. I've become such a fan of hers! So I learned that one of her most favorite stores is Zara! Who could blame here really, Zara is everything! Also, one of my favorite quotes of the day... when Kate Bosworth mentioned 'spaghetti straps' she asked, 'does anyone even call them that anymore' to which Eva Chen responded, 'no, but I still do. These days they're called gluten free brown rice pasta straps'! BRILLIANT! I laughed so hard but it's so true... how times have changed! Eva Mendes was a doll. She's way thinner in person then I expected! She is such a girls' girl! She spoke candidly about growing up poor and how window shopping was the thing to do on the weekends with her mom and sisters. Her love of fashion has recently led her to team up with New York and Company for her very own fashion collection! When asked about her 'go to' hair style, she explained that she often ties it up in a scarf. An audience member quickly handed her scarf to Eva so that she could illustrate for all of us just how she wears this style. She made it look SO easy! Perhaps soon I'll show you guys exactly how to achieve this look so that we could all channel our inner Eva Mendes! We heard from other incredible style influencers such as Lindsey Calla of Saucy Glossie, you know, the Maxinista girl from the TJ Maxx commercials?! Kate Bosworth stunned all clad in her very own collection for Top Shop! Her shoes were drool worthy Stella McCartney... still kinda dreaming about them! Erika Domesek of PS I Made This... was also there sharing her story. I was excited to have her sign my own copy of her awesome DIY book! There were too many influencers to name here but I'll post pictures and label them accordingly so that you could put a name with a face. Confession... I was obsessed with Amber Venz gorgeous braid and uhhhhmazing jeweled ear cuff! Another exciting moment happened during one of our breaks when I bumped into one of my Allure Blogger Awards alumni Katie McBroom of Martinis and Mascara! We were so thrilled to bump into each other and hugged forever! She is as bubbly and sweet as you'd expect her to be! I LOVE her red hair, omg! We had lunch together, which was promptly served on these super cute Asian food containers paired with chop stick forks? Not sure what you call them but they were chic and fun to use! Next, we trotted on down to the 'brand experience' lounge. There was so much to see and do! 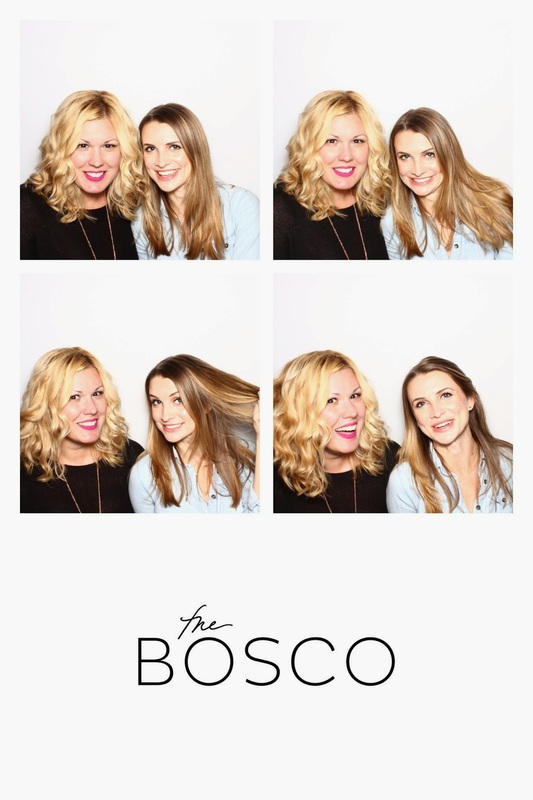 First, Heather and I took a fun picture at the Pantene booth showing off our locks! We also visited Charming Charlie who so generously gifted us with some of their amazing jewelry! I'm in LOVE with some of my pics which I'll show you soon! Style Tag App, launching soon, gifted us with the coolest tote bag! I learned about Kate Hudson's new athletic gear line called Fabletics. They gifted us with a bag filled with a workout headband which I LOVED, a water bottle, thumb drive and a coupon for a FREE OUTFIT!!! I just ordered mine and can't wait to see it in person! I also ordered a few more of their awesome workout headbands! They're comfy and hold the sweat in place! Shop Style was also a fun booth! They took some cute pics of us, reassuring me that I could NEVER EVER be a model! I don't know how to pose! I looked frumpy and fat! lol But it was still fun and I love my little keepsake! They also had the cutest fashion cookies ever! I picked up three... one of a trench coat, one of a bag and one of a dress! They're simply too cute to eat! There were more booths but I just didn't have enough time to visit all. I did see some fun manicures happening. Heather got a quick many opting for a sweet lavender polish... great choice Heather! OK so lets chat about THE BEST moment of the entire day! While on one of our breaks, i was chatting with Niki, Heather and Katie when i suddenly noticed Eva Chen right next to me. My heart fell to the ground and i started to shake! I knew that i had to make my way over. This was my chance to meet one of my style idols! So i walked right over and introduced myself! She could not have been nicer! I took a picture with her which I'll treasure forever and ever! She is such a class act making sure to compliment each and everyone of us on something! She loved my eye shadow which i seem to be getting a lot of compliments on lately so stay tuned for a blog post! But i won't leave you in suspense.... the shadow at hand is Urban Decay's Diamond Dog. Trust me, wear it and everyone will ask! We capped off the conference with a cocktail reception where i finally met the gorgeous ladies behind Enza skincare which I've recently blogged about. I also met the super sweet PR girls for Bare Essentials and a few other fun ladies. Heather, Niki and I dined at a super yummy Japanese BBQ place in midtown. The food was insanely good and the company was even better. These girls are officially in my heart... love them! Honestly, i can't stop thinking about this amazing day. Next year, I'm going back AND I'm going for both days! The experience is just too good to miss out on and the memories are even better. I left LuckyFabb feeling inspired about this wonderful thing that i do... I'm so passionate about my little blog and anything that helps me make it a successful one is certainly worthy of my time! OK so enough chatting... here are all the pics! Beware... there are LOTS! I apologize for the grainy ones as they were taken with my iphone and the lighting wasn't always great. Enjoy! What an awesome event!!! Great recap!! It was so fun Jezz... definitely worth it! Thanks! You ARE a super model Niki!!! OMG still dreaming about it!